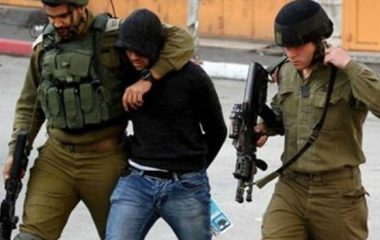 Israeli soldiers abducted, Friday, a young Palestinian man in the Old City of Hebron, in the southern part of the occupied West Bank. Media sources in Hebron said dozens of soldiers were deployed around the Ibrahimi Mosque, installed many roadblocks and searched dozens of Palestinians while inspecting their ID cards. The soldiers also abducted a young man, who remained unidentified at the time of this report, and took him to an unknown destination. Furthermore, dozens of colonialist settlers conducted a provocative tour in Jaber neighborhoods, and many other neighborhoods in the Old City, under heavy army accompaniment.